Both fish and fish oils are effective at lowering raised levels of blood triglycerides. Raised levels of triglycerides are a risk factor for cardiovascular disease. This is because high blood levels of triglycerides represents the presence of the metabolic syndrome. The metabolic syndrome is a cluster of metabolic changes that result from the development of insulin resistance. As changes to the liver tissue progress, triglyceride synthesis is upregulated. Synthesised triglycerides are packaged into very low density lipoproteins (VLDL) and accumulate in the blood. Supplementation with fish oils is effective at lowering blood triglycerides. The reason for this is not clear, but may relate to the ability of fish oils to alter the metabolism of fatty acids in the liver. In particular fish oils may reduce the formation of VLDLs, accelerate the excretion of VLDLs from the blood and also increase peroxisome proliferator-activated receptor gamma (PPAR-gamma) which acts to increase fatty acid oxidation. Fish oil supplements are not necessary to take advantage of these effects. Fatty fish such as tuna, mackerel, trout, sardines and salmon all contain the fish oils that are required to lower plasma triglyceride levels. The current recommendation is to eat three servings of such fish a week in order to provide an adequate intake of fish oils. 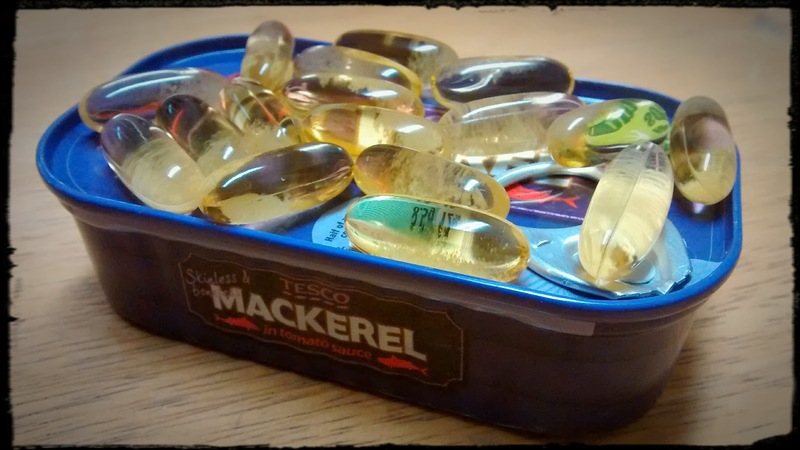 Both canned and fresh fish contain fish oils, and there is no evidence to show that one is superior to the other. Despite the ability of fish to provide fish oils, it is recommended that fish oil supplements are used for this purpose. This is because most studies have used supplements and it is therefore easier to replicate the required dosage with a capsule. However, in addition, our oceans and rivers are increasingly becoming polluted which is in turn poisoning the fish. Regular consumption of polluted fish is now understood to be a serious risk to health. Another reason that fish oils may cause a lowering of triglycerides is because they cause weight loss. The link between excessive body fat and elevated triglycerides is well established, and weight loss is known to reduce high blood triglyceride levels. Fish oils are effective at increasing fatty acid oxidation and causing weight loss, this may explain their beneficial effects. One to three grams of EPA and DHA rich fish oils a day are probably a good place to start.